Michael Duff believes that Clarets centre back James Tarkowski can take his career anywhere he wants after making his England debut. The 25-year-old, who was released by Blackburn Rovers as a teenager, became the club's 28th senior international for the Three Lions in the friendly draw against Italy at Wembley Stadium where the hosts were denied a record-equaling sixth clean sheet in succession. 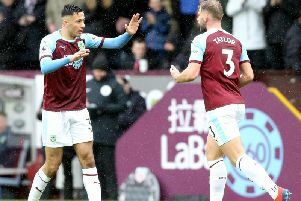 Tarkowski, the fourth Burnley player to earn a cap for England under Sean Dyche, adding to Tom Heaton, Michael Keane and Jack Cork, played on the left hand side of a three man defence, which included Kyle Walker and John Stones. England had led through Jamie Vardy's 26th minute strike, the Leicester City forward firing in to the roof of the net from Raheem Sterling's pass, but Luigi Di Biagio's side equalised from the spot late on through Lorenzo Insigne after Tarkowski was controversially adjudged to have impeded Federico Chiesa. Match official Deniz Aytekin, from Germany, originally awarded a corner kick but later amended his decision after consulting the VAR system. "He deserves it," said Duff. "He, along with others, are bearing fruit of what's happening at the club. "That shows in the number of call ups and debuts from the last couple of years through the work that's going on at the club. "Tarky has come in, bided his time, worked professionally, worked on his game and then gone out this year having been given the opportunity and it's out on the pitch where you're judged. "That's where people make decisions about you. Tarky has just taken it on. Once the players get on the pitch it's up to them to take it to wherever they want to go. He's been excellent in everything that he's done." The former Brentford man, who made his move from Griffin Park just over two years ago, played the full 90 minutes against the Azzurri and now Burnley's Under 23s coach Duff, capped 24 times for Northern Ireland, is confident that his former team-mate possesses the character and mentality to pull on the shirt for his country many more times. Duff, who enjoyed three promotions to the Premier League with the Clarets, said: "Look at his career. He got released from Blackburn at the under 14s or under 15s and they'd paid money for him younger than that. "He's gone away and there are different pathways. They don't all go to a Man United playing in the 16s, 18s, 23s, first team, England. It's not that simple. "He's resilient, shown a bit of character, he's gone to Oldham, come to our place, didn't play, come in, done really well and makes his [England] debut. Hopefully it's the first of many caps. "It's up to him now. That's what the top, top, top players do. You look back at the likes of Beckham, Gary Neville, Steven Gerrard, they don't settle for one. "They want another one and another one, it's that drive and ambition. It's in the performances. "Tarky can go wherever he wants now with regards to where he wants to take his career. He's given himself the platform to really launch his career."